You are viewing the Morris Award tag archive. 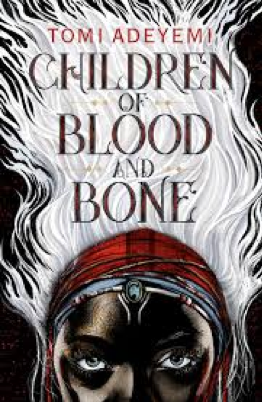 What made you choose a YA story? I hadn’t intended it as a YA story originally! I’ve always pursued picture books, but in grad school I began writing this as an adult story. It was my agent’s idea to make Gerta a teenager, and when I took that chance, the story practically wrote itself. When the character’s right, she tells you her own story! Can you say in a few words what it was like to visit the concentration camps and the impact they had on your story? It was difficult, of course, but necessary. It’s one thing to read about a place, or listen to someone tell you about it, but when I was in the physical places (Bergen Belsen, Terezin, Auschwitz), it felt like I’d been entrusted with something tangible to bring back to my readers—like a trunk of a loved one’s belongings, each with a story attached. These are places that change you. They’re terrible to go to, but anyone who can go, should. Continue reading 2018 Morris Finalists Announced! Continue reading 2016 Morris Award Finalists Announced! 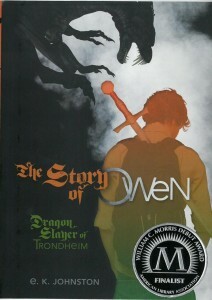 E. K. Johnston is a 2015 Morris Award finalist for: The Story of Owen: Dragon Slayer of Trondheim. Congratulations on being a finalist for the 2015 Morris Award! The idea behind the book – that species of dragons exist in our world because they are carbon eaters – is a different and unique take on the dragon trope in fantasy fiction. Yet it makes so much sense given our over-reliance on fossil fuels. What do you personally believe about the use and overuse of fossil fuels, and what practices do you follow, if any, in your own daily life to address this issue? One common criticism of The Story of Owen is that human beings never developed alternative fuel sources despite the threat of dragon fire as a consequence for carbon emissions. I feel that we are dealing with something similar in the real world, though, without the dragons of course, in that we have been slow to develop the technology to efficiently use wind and solar power. Hopefully it won’t take something catastrophic to give us that final push. For my own part, I try to keep my carbon footprint as manageable as I can. Are you a fan of alternate history books? If so, what other books would you recommend for teens? I am a huge fan of alternate history! I couldn’t read any while I was writing my own, and that was terrible, because I missed them. I love Tessa Gratton’s UNITED STATES OF ASGARD and Holly Black’s CURSEWORKER trilogy. I am really like Maggie Stiefvater’s THE SCORPIO RACES, which shows that an alternate history can be quite small, and still super readable and relatable. I know you’re a forensic archeologist but what is that exactly? Does your profession come into play in your writing? Forensic [insert profession here] just means that you do your job, but with the idea of serving the law. So you can have forensic accountants and forensic dentists…and forensic archaeologists. I learned how to take archaeological principles and apply them to crime scenes (for evidence recovery and the like). It shows up in my books in strange places, but I was trained to research and account for detail, and I think that’s very helpful for writing. 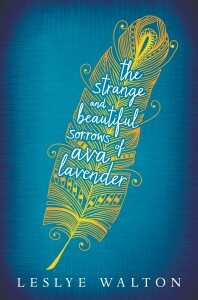 I am so happy you and your book are one of the Morris finalists! 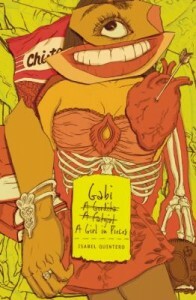 Gabi, a Girl in Pieces is one of the most realistic books I’ve read. It reflects what I saw as a teen and of teens I know, now. Was it your goal to give voice to Mexican-American teens? I loved 2014 William C. Morris YA Debut Award Finalist Belle Epoque by Elizabeth Ross so much that I thought it should be highlighted with both drink instructions AND a pastry recipe. The drink this time is simply black tea â€“ but made properly, soothingly, with a kettle, teapot, loose leaf tea and all the rest. While protagonist Maude Pichon does mention drinking and fantasizing about a â€œbowlâ€ of hot chocolate more than once, and two of the wealthier characters drink coffee a couple times, tea is by far the most commonly enjoyed hot drink in this novel, mentioned more than twenty times. The eats? A recipe for the beloved pastry of Maude’s close friend Marie-JosÃ©e: pain au chocolat, of course! As Hub bloggers Alegria Barclay and Anna Tschetter have respectfully already thoughtfully reviewed Belle Epoque and interviewed author Elizabeth Ross, I will only provide a brief outline of the novel here. 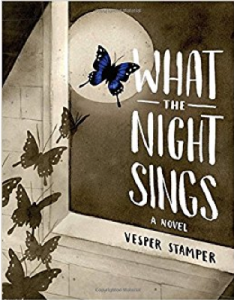 Set in 1888, it is narrated by protagonist Maude Pichon, a sixteen-year-old who has run away from her home in Brittany to start a new, self-determined life in Paris. Desperate to make ends meet, she takes a position as a repoussoir at an agency, serving as a hired â€œbeauty foilâ€ for the wealthy. Supposedly plain-looking women such as Maude are paid by this agency to accompany wealthy women on social outings, with the idea that the women’s plainness will make the wealthy clients appear attractive in contrast. Maude often finds her work degrading, and yet, eventually becomes a bit enchanted by the world of her main client. In doing so she risks ruining meaningful new friendships and a possible love relationship. In our appearance-obsessed 21st century culture, it is impossible not to identity with Maude’s experiemce on some level. Pour the number of cups of water that you desire into the tea kettle (one cup of water makes one cup of tea). Put the kettle on a stovetop burner. Turn the burner up to its highest setting. Meanwhile, warm your teapot by filling it with hot tap water and letting it sit covered for a while. Once the tea kettle is boiling, empty the teapot of warm water. Measure into the teapot one teaspoon of loose leaf tea for each cup of water that you have boiled. Turn off the kettle and pour the boiling water into the teapot and place the lid on it. 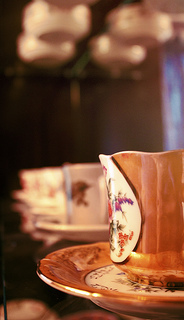 For black tea, let the teapot sit (let the tea â€œsteepâ€) three to five minutes. Longer steeping time leads to stronger tea. After this time is up, for each cup of tea, place a strainer on top of the tea cup and pour your tea through this so that you catch the leaves. Remove the strainer from the tea cup, add anything to your tea that you like (honey, sugar, milk, etc.) and enjoy!